I will definitely be trying this! A great use for the frozen strawberries I still have in my fridge from last summer AND a great way to get yogurt into my husband! Thanks! I will be making this, oh yes, I will. I’m a little disappointed to see all that sugar on a site like this! 1/4 cup sugar with 2 cups of fruit? Just seems like a lot for a healthy treat! 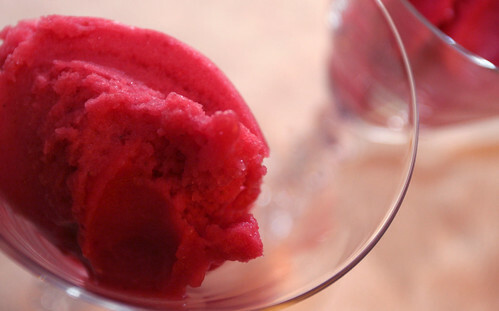 I’ve made similar sorbet with no added sugar and it is delish as is, sans sugar! Esp with some bananas…..Even just frozen bananas + water or coconut milk blended is great with no added sugar. Would love to see some healthy/no sugar recipes! Thank you for the inspiration though to try some sorbets with other fruit options. Num! @Sue, All of us here at NLM come from different nutritional standpoints. 🙂 And the sugar mentioned is ‘to taste’ so can definitely be reduced or completely eliminated as well! Don’t worry – as a brand new blog we’ve had very little time yet to post a lot of our recipes – more are coming! Being in the southern US, frozen treats are a summer favorite. Don’t get me wrong – I love my fruit fresh off the vine/tree/bush, but puree & freeze it on a hot day in August – ahhh! This sounds like an excellent summer treat! I am a lime addict, so will be trying it with lime!